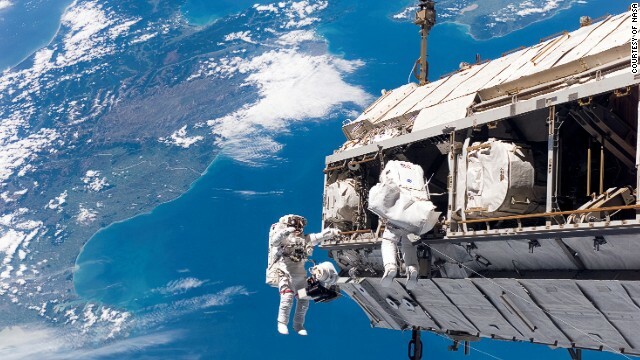 Researchers at the University of California, Davis grew microbes collected from sports teams, historical monuments, museums, spacecraft, and schools and sent them to the International Space Station (ISS) for growth in space. The microbes were collected in collaboration with the public, as part of a nationwide citizen science project called Project MERCCURI. While most of the microbes looked similar on Earth and in space, one type of bacteria actually grew much better in space. Project MERCCURI is a collaboration between UC Davis and a number of other organizations including Science Cheerleader which is a collection of current and former professional cheerleaders pursuing careers in science and math. Most of the sampling events were organized by Science Cheerleader and provided an opportunity to engage thousands of people with microbiology and research onboard the ISS. Two other aspects of the project involved the collection of microbial samples by astronauts on the ISS, and work examining the microbes present on the shoes and cell phones of people at the events. This study, titled "Growth of 48 Built Environment Bacterial Isolates on Board the International Space Station (ISS)" was published today, March 22nd, 2016, in PeerJ. The researchers concluded that most of the microbes collected are, in fact, normally found on the ISS and that the vast majority of them behaved similarly on Earth and space. The one exception, a bacteria called Bacillus safensis, was originally isolated from a Mars Exploration Rover at JPL, before launch in 2004. This bacteria grew 60% better in space than on Earth, for reasons currently unknown. The genome sequence of this bacteria has recently been determined, and may contain clues as to why this strain behaved so differently in space. "A lot of people ask us why we sent microbes into space," said lead author Dr. David Coil, a microbiologist at UC Davis. "Understanding how microbes behave in microgravity is critically important for planning long-term manned spaceflight but also has the possibility of providing new insights into how these microbes behave in human constructed environments on Earth." "This initiative is not just about significant research," said Darlene Cavalier, Founder of Science Cheerleader and an author on the study. "It's about engaging the public in that research. Microbes that they collected are taking a ride on the International Space Station. They're the subject of research by microbiologists and astronauts. We hope this inspires youngsters as well as adults to become more aware of and involved in science."